Listing includes ONE Yeasayer Snowboard Please choose a SIZE from the option menu. Looking for a light, fun, do-it-all board that turns on a dime? 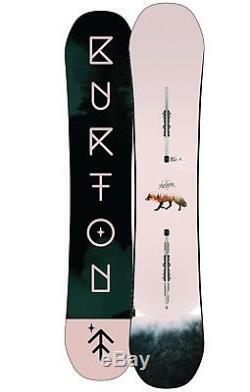 Check out the Burton Yeasayer Snowboard, a new model from the company that invented fun sliding sideways on snow. The Yeasayer is built around a Super Fly 800G core using women's specific Triax fiberglass and a rocker-flat-rocker profile for a forgiving and pivoty ride you'll appreciate more and more as the season rolls on. Just a few turns on the Yeasayer and you'll be saying "Yes" with emphasis. A flat profile between the feet means stability, better balance, and continuous edge control. The tip and tail kick up with an early rise outside the feet for the catch-free and loose feeling you'd expect from a rocker profile. The flex is perfectly symmetrical from tip to tail for a balanced ride that's equally versatile regular or switch. Perfectly symmetrical for a balanced ride that's equally versatile regular or switch. Jib, spin, stomp, and butter with a greater balance of freestyle mobility and cat-like stability no matter which way you point it. This exaggerated tip and tail scooping turns up the edges for a looser, more forgiving feel that adds catch-free fun when riding everything from a knee-high box to neck-deep pow. A tapered tip and tail thickness reduces swing weight for easier mobility. FSC Certified Super Fly 800G Core with EGD. Lightened up and loaded with pop, Burton's dual-species wood core utilizes dual-density vertical laminations of alternating softwood/hardwood to reduce overall weight with no sacrifice in strength or performance. The wood grain is positioned along the toe and heel edges on two continuous zones, perpendicular to the rest of the wood core for consistent edge-hold and added strength. With an overall easier feel, Squeezebox Low brings high-end core profiling technology to the progressing rider. Stiffer zones just outside you feet create a more direct energy transfer to the tip and tail, while enabling a softer, smoother flex between the bindings. The end result is more control with less effort from the rider. Women's Specific Triax Fiberglass. Versatile flex and response for everything from mini to mega shred. Speed, strength, and graphical pop in a base that requires little maintenance. Pass your friends without even waxing. Introduced by Burton long before all the hype about wavy "serated knife" edges, Frostbite extends out slightly beneath your bindings for tremendous edge-hold on hard, icy conditions. Powerful when you need them, playful when you don't, Frostbite Edges are hungry for hard-pack while remaining smooth, slowing, and forgiving. This Burton-exclusive technology allows maximized pop and strength by overbuilding the board, then putting it in a machine that breaks in the board for you. Whether you choose to ride Flat Top, Flying V, or Camber, rest assured that with Infinite Ride your board will maintain its flex, pop, and feel from the first day forward, season after season. A resin formulated with bio-based materials that reduces the carbon footprint by 50% over conventional all-petroleum-based epoxies. Less oil consumption means even less of a carbon footprint per board. Stronger, faster, easier, and more adjustable -- The Channel gives you ultimate control of your stance and your board in a design compatible with all major bindings (not just Burton's). The item "Women's BURTON Yeasayer Flying V Snowboard Flat Top All-Mountain Twin Flex NEW" is in sale since Tuesday, December 18, 2018. This item is in the category "Sporting Goods\Winter Sports\Snowboarding\Snowboards". The seller is "top*outdoor*brands" and is located in Myrtle Beach, South Carolina. This item can be shipped to United States, Canada, United Kingdom, Denmark, Romania, Slovakia, Bulgaria, Czech republic, Finland, Hungary, Latvia, Lithuania, Malta, Estonia, Australia, Greece, Portugal, Cyprus, Slovenia, Japan, Sweden, South Korea, Indonesia, Taiwan, South africa, Thailand, Belgium, France, Hong Kong, Ireland, Netherlands, Poland, Spain, Italy, Germany, Austria, Bahamas, Israel, Mexico, New Zealand, Philippines, Singapore, Switzerland, Norway, Saudi arabia, Ukraine, United arab emirates, Qatar, Kuwait, Bahrain, Croatia, Malaysia, Brazil, Chile, Colombia, Costa rica, Panama, Trinidad and tobago, Guatemala, Honduras, Jamaica, Viet nam.